Improve the clarity and usability of your computer screen with our screen filters and colour overlays, including blue light filters, colour overlays for dyslexia-related visual problems and anti-glare screens designed to reduce light reflections. We also provide privacy filters for those wishing to conceal sensitive information on their screens. Filters and colour overlays can be attached to almost any computer screen to help you work, browse and play with greater ease. With so many of us using computers at work, computer eye strain has become a major job-related complaint. Studies show that eye strain and other visual symptoms occur in 50-90% of computer workers. You can help reduce the risk of screen-related eye issues with an anti-glare filter or anti blue-light filter. Some people who suffer visual complications as a result of dyslexia find they benefit from using a coloured monitor overlay. All of our screen filters are really easy to apply and in some cases can also double up as privacy filters if you also work with sensitive data (see the 3M Privacy & Anti-glare Filter). You can visit our Privacy Filters page for more choice. When outside light cannot be reduced, consider using a computer hood. 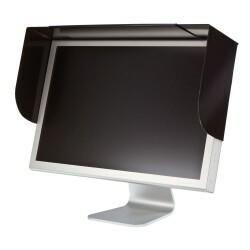 Monitor hoods can help prevent overhead lighting and sunlight reflection causing glare on your monitor. 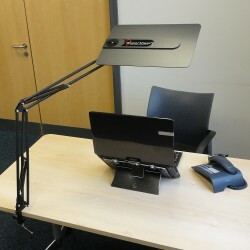 Our Adjustable Anti Glare Screen Hood can be fitted on to either CRT or LCD monitors and again is very easy to set up. 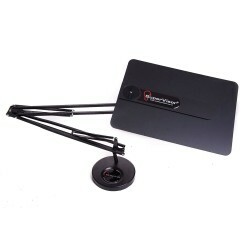 Alternatively, you could consider monitor products such as the LCD Screen Magnifier, which attaches to your monitor to increase character size by more than double. 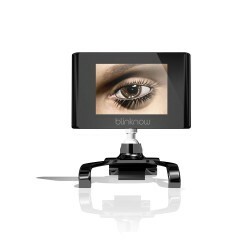 The Blink Now is designed by eye specialists to sit on top of, or beside your computer screen to prompt you to blink at a healthy rate. If you have any questions about screen filters, please don’t hesitate to get in touch with our friendly customer service team.